“See, I still can’t forget Hollywood. There’s no use kidding myself. Maybe some day I’ll go back. Movies are my real racket. But just remember this, brother. I’m not down and I’m very happy. There will be no benefits played for Helen Twelvetrees” — Helen Twelvetrees, 1942 (Feeney). Her Hollywood career was brief, but even with only a few years of top flight stardom, 1930-1933, Helen Twelvetrees left behind a worthwhile legacy in a handful of forgotten films that are ripe for rediscovery. She benefited from her time, her first contract coming in 1929, before the young stage actress even rose to Broadway, though that had as much to do with her cover girl beauty as it did the general coming of the talkies. Her final film, a “B” movie that turned out to be among her best, released in 1939, and then she left Hollywood claiming that the parts just were not there for her. Only 30-years-old, the former top-billed star stayed busy in the immediate aftermath, riding stock appearances to her Broadway debut in 1941, a disappointing and embarrassing flop that lasted just 11 shows. She kept working into the 1950s, but years of alcoholism had taken their toll and before the decade was out a sedative overdose was ruled suicide, a verdict that some may dispute, but that her own son accepted. Helen Twelvetrees was only 49. Upon her Hollywood arrival the petite and frail beauty was compared to Lillian Gish, but after a breakout role in Tay Garnett’s Her Man (1930) revealed Helen Twelvetrees as an explosive package of nerve and vitality, the comparisons shifted to Gloria Swanson. By the time of Millie (1931), only a few months later, there was no apt comparison for the young star, who was dubbed “the perfect ingenue” by her studio. 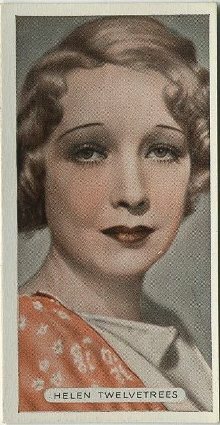 She was then queen of the weepers, but underneath she possessed a hardboiled edge that taken alongside her distinctive beauty made Helen Twelvetrees a unique star of the era. “Helen Twelvetrees looks no more like Lillian Gish than a piano looks like a piccolo, or than spinach looks like spaghetti.” Alma Talley, 1932 in Picture Play magazine. December 2015 note: After completing Helen Twelvetrees, Perfect Ingenue I returned to this post to make a few corrections. I've let the original text stand, striking it through and adding a parenthesized correction when necessary. Above: Helen Twelvetrees, age 3. New Movie Magazine, January 1932. She was born Helen Marie Jurgens, Christmas Day, 1908, in Brooklyn, New York (Actually Christmas Day, 1907, as per her birth certificate). Helen’s father, William Jurgens, was of Dutch ancestry and had come from Wisconsin to New York, where he took work in the newspaper industry (William was German on his father's side; English on his mother's). Her mother, the former Helen Seward, came from a family with English and Irish origins that had been in Brooklyn for over a hundred years (more like mid-19th Century). William was 21 when Helen was born; her mother, Helen, just 19. By the time his daughter reached Hollywood, William Jurgens had advanced to become advertising manager for the Brooklyn edition of the New York Evening Journal. The Jurgenses lived at 145 Ridgewood Avenue in the East New York section of Brooklyn when Helen was young. She attended Public School No. 119 and graduated Brooklyn Heights Seminary in 1925. By that time the family had moved to Flatbush and Helen’s little brother, Jack, was born. Helen’s interest in drawing led her to enroll in the Art Students’ League on West Fifty-Seventh Street in Manhattan. It was while there she was noticed by a member of the teaching staff, George Bradshaw Crandall, who also happened to be a noted illustrator with a commission in pocket to ink a cover for Saturday Evening Post. That issue, dated October 23, 1926, led to interest from several stage producers, who contacted Crandall to discover the identity of his model. Helen, of course. Helen enrolled at the American Academy of Dramatic Arts, but studied there for only a few months before stock producer Stuart Walker visited and was impressed by the young beauty. When Walker offered Helen a place with his company, she jumped at the opportunity. Accounts vary, but it was either during her brief time at the Academy or shortly after joining Walker’s troupe, that Helen met Clark Twelvetrees, another aspiring actor. Clark was son of prolific illustrator Charles H. Twelvetrees (1872-1948), who was noted for his likenesses of cherubic faced children. He is still popularly collected today , with vintage postcards offering an affordable way to sample his work. According to Helen, in a 1932 interview with Hollywood journalist Wood Soanes, she spent three months at the Academy before departing with Walker and, “It was in his company that I met Clark Twelvetrees and married him without consulting my family. We had known each other two entire weeks.” They were married February 21, 1927 in Greenwich, Connecticut (Their marriage certificate says February 28, 1927 at Brooklyn's Borough Hall). The date is just four months after publication of Helen’s Saturday Evening Post cover, so if they did not meet until she joined Walker’s company, then perhaps they did only know each other for a couple of weeks. It was a tempestuous union that ended in divorce a little more than three years later. Clark Twelvetrees was a heavy drinker and, Helen said, physically abusive, providing a hefty dose of reality to the young actress during what would have otherwise been one of the most exciting periods of her life. The newlyweds alternated tours with Walker’s company in Cincinnati and Indianapolis, then just three months after they had married the couple separated while back in New York. Family pressure reunited them, meanwhile, Helen tramped along Broadway visiting producers with hopes of landing work. “We were going down the stairs when a voice hailed me from above. I was called back and asked if I had ever read An American Tragedy. I had never so much as seen it, but three months in stock had taught me the value of a good blur. ‘Who hasn’t?’ I replied, and still feel proud of that answer. My questioner, without identifying himself, handed me a script and told me to return in an hour to read some of it” — Helen Twelvetrees, 1932 (Soanes). Her questioner was producer Horace Liveright, who engaged Helen in the major role of Sondra in the Chicago company performance of the play based on the Theodore Dreiser novel. Broadway had already made Miriam Hopkins a star playing the same part, later played on film by Frances Dee in Paramount’s 1931 adaptation, and Elizabeth Taylor in 1951s A Place in the Sun. Helen’s rise wasn’t as meteoric as that of Hopkins, but after An American Tragedy, she had no trouble finding work. Yen flopped, but Roulette got her noticed by a scout for Fox Films, who was out doing the theatrical rounds looking for actors who spoke well enough to have potential in the new talking films. Helen took the train to Hollywood, though left a plum role behind in the stage adaptation of Sinclair Lewis’s Elmer Gantry, a decision that Helen rued, though her early film experiences did benefit her more in the short term. Above: Title of July 1929 story in Screenland magazine tries to explain away the lisp. Above: Helen is sitting at the far left. While The Ghost Talks was undoubtedly a setback, Helen first arrived in theaters in the sweep of publicity that came along with being named one of the prestigious Wampas Baby Stars in 1929. The hindsight of history points to this being an especially notable Wampas class including, in addition to Helen, Anita Page, Jean Arthur, Sally Blane, and Blane’s sister, Loretta Young. Fox did not choose to renew her contract, and Helen decided to return to New York with hopes of landing something on Broadway. Helen said she was packing for this trip when her friend Dorothy Ward arrived and asked her to tag along on a venture to Pathé, where she was going to see about a job for herself. While waiting for Ward to return, director Edmund Goulding spotted Helen and thought she’d be perfect for the lead in The Grand Parade, which called for a girl who, “must be wistful and bitter and heartbroken” (Soanes). Sounds like our Helen! She got over well enough in the part to be offered a long-term contract by Pathé, who cast her in the circus drama Swing High (1930), and then in what turned out to be the most important role of her career, Her Man (1930). By this time of her greatest initial success, Helen’s first marriage was over. Clark Twelvetrees met a violent end that, considering his earlier bout of infamy, headline writers were happy to take advantage of: “Short Fall Kills Actor, Survivor of 6-Story Leap,” was how the New York Post covered it. A painter was arrested and charged with Clark’s murder, but later cleared. He claimed that he had seen Twelvetrees strike a woman he was arguing with on the street, so he jumped in and hit Twelvetrees, knocking him to the pavement. Twelvetrees died of a skull fracture two days after the incident. Helen kept the Twelvetrees name after her divorce, and after the success of Her Man. Her popularity grew with her second hit film a few months later, Millie (1931), so she ultimately stuck to the Twelvetrees name for the remainder of her career. It was during production on Her Man that Helen met stunt man Frank "Jack" Woody. Helen and Woody took Hollywood by surprise when they were married immediately after her divorce from Twelvetrees went through, or so they thought. The couple actually went a bit too fast, as they wed in Reno before Helen’s divorce from Twelvetrees was finalized on April 1, 1931, and then they had to do it all over again a few weeks later. While her marriage to Woody was also destined for the divorce courts, any man had to be a better match for Helen than her first husband and at least her second marriage produced a son, Jack Woody, who was born October 26, 1932. The timing of Helen’s pregnancy and subsequent maternity leave likely did more damage to her career than any other folly the supposedly difficult employee may have committed. Her own studio, now RKO after their merger and eventual absorption of Pathe, removed her from the lead of Truth About Hollywood, a role that went to Constance Bennett in a film eventually released as What Price Hollywood?. RKO had two additional films planned for Helen, Miracle Night and Prodigal Daughter, which were likely abandoned due to her pregnancy. She was also slated to re-team with State’s Attorney star John Barrymore in a production of W. Somerset Maugham’s The Moon and Sixpence, but that project didn’t happen until years later with all new principals. In March Variety reported that RKO refused to loan Helen to United Artists for tests on Rain, released in October 1932 with Joan Crawford in the lead, nor would they loan her to MGM to test for Red-Headed Woman, a June 1932 release starring Jean Harlow that is now considered a classic. The latter is especially disappointing after Helen’s turn as hot-tempered red head Millie, which even found her humming a little tune about being a “red headed woman” throughout. Film historian Dan Van Neste, also points to the Helen Vinson role in Warner Bros. I Am A Fugitive from a Chain Gang, as another part little Jack’s arrival may have cost Helen. A few of these casting notes were likely either trade speculation or just pure chance, as RKO did loan Helen to MGM in June 1932 to appear in Unashamed with Robert Young and Lewis Stone. Nevertheless, if Helen had been cast in even just one of those roles, excepting Rain, which is only remembered today because of Crawford, it certainly would have impacted her legacy in a major and positive way. Instead the loan out to MGM for Unashamed would be her final film for several months while the Woodys welcomed the new member to their family. Upon Helen’s return to RKO just after the New Year, the two parties decided a mutual parting was the best course of action (Van Neste). As popular as Helen Twelvetrees was with the fans, her latest films did not have the box office appeal of previous titles like Her Man and Millie. Plus her place on the RKO roster had been usurped by newcomer Katharine Hepburn (not really). Helen wound up signing a deal with Paramount and returned to screen opposite Maurice Chevalier in A Bedtime Story, an April 1933 release. Above: RKO trade ad from March 21, 1932, advertising the movies that never happened. She also appeared in the very entertaining Disgraced! (1933) at Paramount, before moving over to Columbia to play in one of her better films, My Woman (1933), with Wallace Ford and Victor Jory, and then Universal for King for a Night (1933), in which she played Chester Morris’s sister. 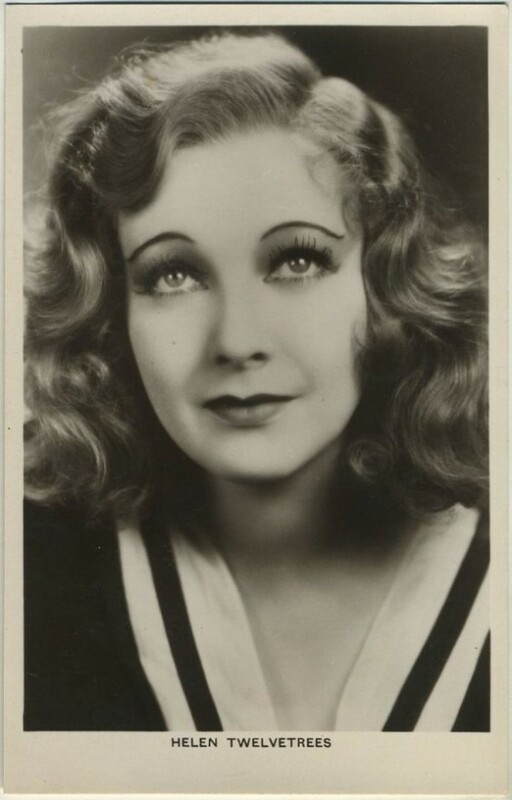 By this time Helen Twelvetrees was no longer a top ranking star, a position confirmed early the next year when she signed a deal with Fox Films as a featured player. Under that contract she appeared in three films, including Now I’ll Tell (1934) with Spencer Tracy, before she jumped back to Paramount to play for laughs in One Hour Late (1934), a shaky but enjoyable showcase for singer Joe Morrison. A small and disappointing subordinate role in Times Square Lady (1935) with Robert Taylor and Virginia Bruce at MGM was followed by a string of “B” films that saw Helen billed under the likes of Donald Cook, Ben Lyon, and even ZaSu Pitts, who only a few year earlier had played Helen’s maid in A Woman of Experience (1931). Hollywood stardom had given way to Hollywood survival. Above: A Pathe ad from late 1930 shows where they put the emphasis - Helen along with Constance Bennett and Ann Harding are the focus. Opportunity, of sorts, knocked from distant shores. On October 24, 1935 Cinesound Productions announced that Helen Twelvetrees was coming to Australia to appear in one film, which turned out to be Thoroughbred (1936), a horse racing story. Helen was the first of a few movies stars lured from Hollywood in an attempt to boost the Australian film industry. Charles Farrell and Victor Jory soon followed. The experience seems to have contributed the final straw in Helen’s marriage to Jack Woody, but it must have been a glorious time all the same, as Australia treated Helen as though she were Garbo or Gable, with a stream of gifts, honors, special appearances, and non-stop press coverage from her arrival aboard the Monterey on December 2 until her departure, March 5, 1936. My favorite bit of press coverage came the day after Helen’s arrival, when the Lord Mayor greeted her as “Helen, darling,” during a welcome at Town Hall. Helen’s carefree and somewhat mischievous reply, in which she addressed him as “My Lord Mayor, darling,” was certainly an icebreaker with the Australian press and public alike. In between all of the kind words, gifts, and receptions, there was one story that, despite sticking with the overall positive tone, hinted at trouble. “There has not been any trouble between my husband and myself,” Helen said, after Jack surprised the press with his abrupt departure on January 18. “We parted the best of friends. There was to us nothing sudden about his leaving, because it is something we had planned.” Little Jack stayed on in Australia with his mother (Thoroughbred director Ken G. Hall provides an alternate version of events in Australian Film: The Inside Story). There had been talk of Helen sailing from Sydney to London, by way of New York, to appear in a film for a British producer who was impressed by her Australian engagement, but that never happened (She was confused with Helen Vinson, who had appeared in Love in Exile for Gaumont British). Neither did Woody. Two days later, on April 15, 1936, Helen won the uncontested case, and custody of their son, in a hearing where she claimed that Woody drank too much and often humiliated her by his use of “violent language” in the presence of others. Helen’s Australian venture did nothing in terms in boosting her Hollywood career. There were only three movies left for Helen Twelvetrees, though the last of those, Unmarried (1939), co-starring Buck Jones at Paramount, is a great showcase for Helen and worth seeking out even by those who don’t have an interest in Twelvetrees . In the late ‘30s she took on some radio work between film roles and eventually returned to the stage. Stock performances in 1939 saw Helen featured in You Can’t Take It with You in Pawling, New York, and The Greeks Had a Word for It in Maplewood, New Jersey and on Long Island. In late 1940 Helen sued RKO for $100,000 in damages and tried to stop them from showing I’m Still Alive, a film about a temperamental Hollywood actress who married a stunt man—Helen Twelvetrees was mentioned quite a bit by the press in their promotion of the film. The case dragged on and Helen eventually settled in 1943 for a measly $1,100 (Van Neste). Since her name seems as well associated with the movie as any of the cast members, I would have thought she had a stronger case. Helen finally made it to Broadway in February 1941, but what a terrible disappointment it must have turned out to be. She starred in Boudoir, the first English language play by Jacques Deval. If you’re not familiar with Deval’s name, it had a good deal of credibility behind it then, as he was author of the original French versions of successful productions such as Tovarich and Her Cardboard Lover. He also directed Boudoir. Variety was brutal, calling the play, “one of those opening night embarrassments the Broadway threatre must occasionally endure,” and claiming the crowd, “laughed the piece almost off the stage.” Variety took pity on the performers for being saddled with such a poor show, but took time to swipe at Helen, saying she was, “a looker, but her playing is rigidly expressionless.” The show closed after just 11 performances and Helen Twelvetrees never made it back to Broadway. “There’s no use taking yourself seriously in Hollywood, because the dream has to end sometime. You get to the top fast and you slip just as fast. So why have any illusions? I know, brother, because it happened to me … Sure it hurts when you see the handwriting on the wall. It hurts like the devil.” — Helen Twelvetrees, 1942 (Feeney). Helen resurfaced touring with the U.S.O. during World War II. It was during her run in The Man Who Came to Dinner that she met the Air Force Captain who became her third husband, Conrad Payne (fourth husband). They married in Paris in 1946 and Helen largely withdrew from the public until 1951, which seemed to be a busy year. She had a brief run on Channel 5 in New York as hostess to a package of films under the “Royal Crest Theater” banner, but her more demanding task that year came when she took on the role of Blanche DuBois in a Sea Cliff, Long Island production of A Streetcar Named Desire. Dan Van Neste wrote that, “Helen won raves.” (For a fascinating, behind the scenes look at Sea Cliff’s Streetcar, including a couple of photos of Helen, this post at Here in the Hills is MUST reading). Van Neste, in his Classic Images profile, is best turned to for details of Helen’s later years, as he was able to interview Helen’s son, Jack, in 2004. Jack Woody recalled that his mother began drinking a lot in 1941, while they were living in a Madison Avenue apartment. He thought the marriage to Payne got off to a good start and mentioned that they moved around quite a bit in those first few years while Payne still served in the military. Helen went with her husband to Japan and San Antonio, Texas, before eventually settling in Harrisburg, Pennsylvania, near the Olmsted Air Force Base. Helen’s alcoholism eventually caused a kidney ailment accompanied by great physical pain. On February 13, 1958, Helen overdosed on sedatives. She was rushed from her home to the Olmsted Air Force Base Hospital, where she died. Only Helen Twelvetrees can know whether she was trying to kill herself or simply quell her pain, however her death was ruled a suicide and even her son agrees with the prevailing opinion about his mother’s death: “I do believe she committed suicide. I think at that point she was extremely unhappy.” He added, “Conrad was abusive too” (Van Neste). For years Helen’s cremated remains were stored in an unmarked grave in the Middletown Cemetery. A marker was finally placed on her grave in January 2013. The tragedy of Helen Twelvetrees is that her biography does not seem very distant from the characters she portrayed during her peak years on screen. It always seemed to come down to the wrong man for Helen. Her bouts with the bottle seem unimaginable after surviving her marriage to Clark Twelvetrees, though maybe that experience just made alcoholism the familiar and natural course once she had more spare time than work. She played alongside John Wayne, Clark Gable, and Spencer Tracy, but not in the right movies. She never appeared in a film for Warner Bros. and was only in two at MGM. Some of her RKO titles will crop up on Turner Classic Movies and a few of those have been released by Warner Archive, but Helen is in a way disadvantaged by her own peak, because she was often the star intended to carry a production, John Barrymore excepted. Classic film fans aren’t as likely to seek out titles like Her Man or Young Bride, though they should, because none of their favorite stars are in these movies. They are Helen Twelvetrees movies. Most who watch Millie are doing so to see Joan Blondell, not Helen, and so that film, given Helen’s performance, is likely her best gateway to new fans. I didn’t mind making ‘B’ pictures—shucks—everybody has to make them sometime. But when the producers put me in films that should have been placed in class ‘Z’—that was enough. Bad pictures hurt an actress more than staying out of them altogether. So I got fed up and said the hell with this damned picture business and came to New York to be with my 9-year-old son, Jack” (Feeney). For more about the movies that Helen Twelvetrees appeared in, please see my Films of Helen Twelvetrees post which offers 19—and counting—capsule reviews of the movies she appeared in (Subscriber note: 3 additions and 1 major edit to this listing since you received it by email a couple of week ago). I posted that “Films of” article when I began researching the life of Helen Twelvetrees for the Classic Movie Blog Association “Forgotten Stars” blogathon. That blogathon is now over, but you’ll want to check out the list of participants for more articles about other similarly forgotten and overlooked stars of Hollywood’s Golden Age. While you’ll find several sources for this article named below, special attention should be shown to Dan Van Neste’s article “Heartbreak: The Helen Twelvetrees Story,” found inside the Spring 2005 edition of Films of the Golden Age magazine. Dan’s is the only other piece I’ve seen about Miss Twelvetrees that bothers to go this in depth about the actress, and was invaluable as a checklist of sorts in proofing my article. His 2004 interview with Helen’s son, Jack Woody, makes the piece an absolute treasure to the Twelvetrees fan. “Actress Reweds Husband.” Sarasota Herald 22 April 1931: 2. Web. Google News. 26 October 2014. “Actress Says Husband Was Drunk at Wedding.” Reading Eagle. 26 March 1930: 6. Web. Google News. 26 October 2014. “AUSTRALIAN FILM.” Newcastle Morning Herald and Miners' Advocate (NSW : 1876 - 1954) 25 Oct 1935: 10. Web. 7 Nov 2014 . “Auto Fender Saves Actor in Five-Story Tumble.” Buffalo Evening News 26 August 1927: 4. Web. Old Fulton NY Post Cards. 26 October 2014. Blair, Harry N. “Helen Twelvetrees: Champion on the Bike.” The New Movie Magazine 1931 Jan: 16. Web. Media History Digital Library. 3 November 2014. “Blonde Screen Actress Files Suit for Divorce.” Southeast Missourian 26 March 1936: 1. Web. Google News. 4 November 2014. Feeney Jr., Harry. “Helen Twelvetrees: Back From Limbo.” New York Post. 6 March 1942: 5. Web. Old Fulton NY Post Cards. 4 November 2014. “Fistic Skirmishes In Movie Colony.” Evening Citizen (Ottawa). 14 April 1936: 19. Web. Google News. 4 November 2014. “HELEN TWELVETREES.” The Sydney Morning Herald (NSW : 1842 - 1954) 4 Dec 1935: 20. Web. 7 Nov 2014 . “HELEN TWELVETREES.” The Sydney Morning Herald (NSW : 1842 - 1954) 5 Feb 1936: 8. Web. 7 Nov 2014 . “Helen Twelvetrees, Brooklyn Girl and No Doubt About It.” Brooklyn Eagle. 2 February 1941: 6. Web. Old Fulton NY Post Cards. 4 November 2014. “Helen Twelvetrees Says Goodbye With Tears in Eyes.” News (Adelaide, SA : 1923 - 1954) 5 Mar 1936: 12. Web. 7 Nov 2014 . “Helen Twelvetrees Wins Divorce; Says Mate Abused Her.” Milwaukee Sentinel 16 April 1936: 10. Web. Google News. 4 November 2014. James, Franklin. “No, Thir—Helen Doth Not Lithp!” Screenland July 1929: 56. Web. Media History Digital Library. 3 November 2014. Lowry, Cynthia. “For Nine Years No Tears After Long, Briny Career.” Daytona Beach Morning Journal 1 Aug 1955: 2. Google News. Web. 14 Mar 2013. “NO TIME TO SEE HUBBY OFF.” Sunday Mail (Brisbane) (Qld. : 1926 - 1954) 19 Jan 1936: 2. Web. 7 Nov 2014 . “Painter Held in Death of Clark Twelvetrees.” Sarasota Herald & Tribune 23 August 1938: 3. Web. Google News. 26 October 2014. Parsons, Harriet. “Helen’s Shadow of Tragedy.” Modern Screen September 1931: 26. Web. Media History Digital Library. 3 November 2014. Rankin, Ruth. “Design for Acting.” Photoplay. January 1934: 79. Web. Media History Digital Library. 3 November 2014. “Short Fall Kills Actor, Survivor Of 6-Story Leap.” New York Post 9 August 1938: 11. Web. Old Fulton NY Post Cards. 26 October 2014. Soanes, Wood. “Helen Twelvetrees Can See Benefits Of Rough Roads Once Traversed.” Oakland Tribune. 22 May 1932: S-7. Web. Google News. 26 October 2014. Talley, Alma. “A Lady in Luck.” Picture Play. April 1932: 39. Web. Media History Digital Library. 28 October 2014. Tighe, Dixie. “Brooklyn Welcomes Its Own Helen Twelvetrees.” Milwaukee Sentinel. 12 January 1931: 5. Web. Google News.26 October 2014. Van Neste, Dan. “Heartbreak: The Helen Twelvetrees Story.” Films of the Golden Age Spring 2005: 22-44. “Young Actor Recovering From His 6-Story Leap.” Brooklyn Daily Eagle 30 August 1927: 3. Web. Old Fulton NY Post Cards. 26 October 2014. That is quite a photo of Helen at age 3. She looks like a movie star even then! She definitely looks fond of the camera! That was the last time she looked good. I just saw Millie, and she is one homely heffer that was saved by makeup. Of course she was a decent actress, but nowhere near a beauty IMO. My goodness what a stupendous article – I was hooked from the first sentence. one of her “weepy” films, she was far from the “door mat” she occasionally played. same. I will definitely seek that one out now. Thanks for just a terrific article Cliff. Thanks so much, Diane, very glad you enjoyed it! What I liked best about the quotes is that the later they were dated, the more I trusted them and the more spirited she sounds. As so often happens, it sounds like the calamity of her life was choosing the wrong man, again and again and again. I haven’t picked up Persons in Hiding yet because of exactly what you say, but I’m going to break down and grab that and Hollywood Round-Up some time soon. The one I’ve begun hunting for is Thoroughbred, her Australian film, which I thought I found but appears instead to be something from the US starring Toby Wing (which is probably enough for me to take a shot on it anyway!). I was startled by Unmarried, so startled that I’m going to give it another view sometime soon, just to make sure. I know it’s a little “B,” but she’s pretty equal to Jones in it and shows so much that I’m shocked no other satisfactory offers followed. Thanks again! Hi Cliff, I stumbled upon this article whilst searching for something else and glad I am that I did. Helen Twelvetrees passed away a mere twelve days prior to my birth and came to Australia when my Mum was only four. The drawings did her no justice, she was so beautiful. I will absolutely be checking out her movies. What a fascinating read! Thank you. Glad you found the article! I’ve actually been working on a full-length book about her and her films since the time that I posted this, it should be available within the next couple of months. Definitely gorgeous, and more talented than she was given credit for as well. Thanks for reading! There is more to the story, as there so often is. At some point in the saga, Clark Twelvetrees married a show girl name Muriel Patterson, who bore him two children, Diane and Patrick. She had dark hair but otherwise bore a strong resemblance to Helen. She married a WWII Navail Aviator whose name was also Patterson, G.A. Patterson, who happens to have been my first cousin once removed. He adopted her daughter Diane Twelvetrees Patterson, but not her son, because his stiff-necked wealthy mother did not like him.. As I was growing up I knew their father had allegedly killed himself and that he was an actor and a playwright. Patrick Twelvetrees was a handsome young man. Patrick married a girl from Coronado named Patricia Bennett, who was Miss Coronado. Their children Valeria and Clark Twelvetrres were flowergirl and ring bearer at my first wedding. The last I saw of Patrick was at his mother’s funeral in June, 1963. He was divorced and was in a custody battle over the children. His mother Muriel and step-father G.A. both died of alcohol related causes. Like his father, Patrick was incredibly handsome I have no idea what happened to him but I do believe it is his son whose Florida booking photo appears on Pinterest. I stayed close to Diane Twelvetrees Patterson who married and had several children. She had been adopted, as stated above, and when her adoptive grandmother my great aunt Edna PAtterson died, she came West from Newport for the services. She and my mother were the Patterson heirs.. That was the last I saw of her. She was a beautiful woman with a handsome husband from a wealthy Midwester family, but she was fighting the same demons that plagued her natural father, his first wife Helen, her mother and her adoptive father. Her parents had a true Wine and Roses life in Coronado, where she was raised with nothing but the best, and lived in one of Coronado’s finest houses. Her parents, who had also been at the hub of Coronado society, ended up living over a garage.Guy and Muriel were among the beautiful people and somehow always found someone willing to help them keep up their appearances at the officer’s club It is a sad story. Thanks very much for the comment and history about Clark’s descendants. I have been working the past ten months in expanding this piece about Helen Twelvetrees into a longer book-length work, divided somewhat equally between her biography and her films. I don’t cover Clark very much after he and Helen split, but I do give over a paragraph to his death—all of the reports from that time say that he was with a woman who was his second wife, but name her as Ann Twelvetrees. Do you know if Muriel ever went by that name? Or perhaps he was with somebody else that the papers said or thought was his wife? The only other reference I could find to Clark’s second wife was a 1933 report about a pretty nasty car accident, but she’s referred to only as “Mrs. Clark Twelvetrees” in that. Thanks again, this was very interesting! PS: If you prefer the privacy of email, I can be reached at [email protected]. No Anne that I’m aware of. I lknow that G.A> Patterson met Muriel at a party when he was part of a ticket tape parade and a series of receptions at the end of the war. Whether she and Clark were legally married is a mystery, but I through they had been. I love Muriel, who had a Lauren Bacall voice and called me “doll Girl.” I last saw Clark and Muriel’s son Patrick at his Mother’s funeral in 1962. I reached out to him to to let him know of her death through contacts I had with the Hollywood media and it worked. His Coronado family had distanced themselves from him. We spent the day together, which allowed him to avoid contact with his step-grandmother, who disliked him. My Coronado relatives said that he was gay, which to the would have been an anathema. I stayed in contact with his sister Diane, who is still living but in her late 80’s. The picture you post of Clark could just as well be Patrick. I am toying with writing a novel based on my cousin G.A. Patterson’s life. His first wife was an heiress from Chicago, who was my God mother. She, too, was a Helen, and died of T.B. during the years before G.A. was a bassist in George Duffy’s Orchestra. When she died, he left the US and flew glider missions over the Channel with the R.C.A.F. until the US entered the war, and he became a naval aviator. His life is a mix of the Eddie Duchin Story and the Days of Wine and Roses. Compared to him and to Muriel, my parents were very pedestrian, but in the long haul, they had better lives. For some reason, I suspect Patrick had contact with Helen Twelvetrees, but not Diane. Brilliantly entertaining and well written article Cliff. Thank you, @Anonymous – I should be just days to a week away from posting the completed book for sale. Am working on finishing up the index this very morning! This article is going to need a few edits after I bring that out. Muriel Ann Patterson was Clark’s second Wife. On August 7, 1938 He beat his second wife. A painter Intervened and he struck Clark which his Skull was Fractured Caused by James Pakovicz on August 7, 1938 Location: 149 E. 38th St Manhattan, New York, USA He was arrested on August 23, 1938. However, he was Exonerated on September 1, 1938 By the wife of the Late Actor Clark. Clark was born Leroy Clark Twelvetrees on August 5, 1905 Manhattan, New York, USA His parents were Rose Barrington Clark and Charles Henry Twelvetrees. Rose Barrington Clark was the Daughter of James Taggart Clark and Mary Eva Shaw. Charles Henry Twelvetrees was not a very nice man to women. Clark was a chip off the Old block both had some serious issues with women. 1st Wife was Anna Feder daughter of Edward and Marie Feder married: February 13, 1894 Manhattan NYC. On December 25, 1902 Charles gets into a very nasty fight with Anna. She is distraught and she commits suicide by taking overdoes of Bichloride Mercury. When the police where called they found her on December 26, 1902. They taken her body to the morgue and Charles has no desire to even claim her body. Anna came from a very well to do family. 2nd wife Rose Barrington Clark daughter of James Taggart Clark and Mary Eva Shaw. October 5, 1903 Manhattan NYC. She gives birth to their only Child Leroy Clark Twelvetrees AKA Clark Twelvetrees actor with many mental problems. He abandon’s her and they divorced about 1919. Rose died August 14, 1946 Sydenham Hospital Manhattan, NYC. again the Ex Wife of Charles Henry Twelvetrees the body was unclaimed at the Morgue. She had a hard time coping with the loss of her only son Clark. 3rd wife Vera Albert they married Abt 1918 and they had a daughter Cecilia Twelvetrees. Vera dies April 1981 She was the daughter of Louis and Rebecca Albert. The real maiden name was Alperowicz It was of Russian Jewish. The name was changed to simulated into American Culture. Muriel Ann Patterson Twelvetrees Age 25, was in a serious car accident on April 9, 1933 Rockaway Queens The Drive was Muriel Phelan Age 21, a friend of MS Twelvetrees. The car was struck by another driver. Muriel Ann Patterson suffered a broken leg. Thank you for taking the time and effort to leave this information. I’ve emailed you with an excerpt of the section I wrote about the death of Clark Twelvetrees. Thanks again! Helen Twelvetrees now has a marker on her grave. It is small with only her name and birth and death dates. My backyard is against the cemetary she is buried in. My yard is only a few feet from her grave. The grave is in the old part of the cemetary. Hi all; I am Helen’s great-grandson – I placed the marker in January of 2013 after we had honestly lost track of where she was buried. I knew it was near the Middletown area so after a few weeks of research o found the cemetery, spoke with the keeper and together we located the spot of her ashes and placed the simple black granite marker a month later. On another note, this is without a doubt the most comprehensive and well written biography of her life and I’m glad my grandfather Jack was included. Jack Woody passed away on May 6th, 2016 after a long battle with colon cancer. I will be burying some of his ashes next to his mother and updating the marker in the next three months. I’ll keep you all posted. Hi all; my name is James, I’m Helen’s great-grandson – I placed the marker in January of 2013 after we had honestly lost track of where she was buried. I knew it was near the Middletown area so after a few weeks of research o found the cemetery, spoke with the keeper and together we located the spot of her ashes and placed the simple black granite marker a month later. Thank you so much for your comment, I am especially pleased that you enjoyed the post! Since the time I first wrote this I have expanded the post into a full book: about one-half biography, one-half articles and reviews for each of your great-grandmother’s films. If you’re so inclined, please do send along an email to me at [email protected] and I’ll get a copy off to you. My condolences on the loss of your grandfather. After spending so much time researching Twelvetreeses and Woodys I am especially saddened to hear of your loss. Please do keep us posted on your activities around the family gravesite, and whatever other information you care to share. Thank you again for taking time to leave a comment: your kinds words about the post itself have made much more than my day! Hope to hear from you again! Great article on another forgotten actor from my favorite era. In the last year I’ve become quite enamored with the movies of the pre-code era and Hollywood up until the late 40’s. I’m 55 years old and remember these movies being common fare on television up until the late 70’s. Such fantastic actors and movies! Harlow is definitely my favorite but others like Una Merkel, Marie Provost, George Brent, and Chester Morris are equally important to this era. Thank goodness we have Turner Classic Movies to keep the the memory of these people alive along with their movies. I stumbled upon this site by accident or serendipity? When I saw the name Helen Twelevetrees I was immediately interested Why? Several years ago I bought some Rocky & Bullwinkle Dvds in one one of the episodes ( I don’t remembet,) the name Helen Twelevetrees was mentioned. I wrote het name down meaning to look it up . What a fascinating and tragic story about her life perhaps with the right actress, someone would make a movie of her life. Thanks for stopping by and commenting. The name itself is mesmerizing, isn’t it? I wasn’t aware of the Rocky & Bullwinkle reference, but she does seem to keep popping up for me: a few months after I put out the book, my sister called me in a panic to tell me about a quick Odd Couple reference that I missed (the Hollywood episode with Bob Hope). A movie would be great, though I’d happily settle for a documentary! I found out what the reference was, the joke was she was Lassies favorite actress. ( I’m sure you get it.) I found one of her movies on YouTube. ( Unmarried) her Grand Niece left a comment underneath it. IMDB.com needs an update it said that her grave was unmarked.